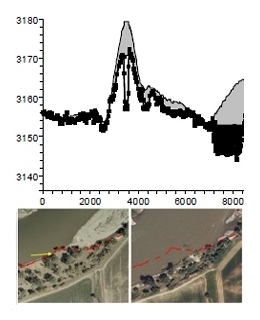 Flood modeling has produced estimated inundation areas and depths for the developed conditions and hypothetical pristine conditions of the Yellowstone floodplain for 2-year, 5-year, and 100-year events for every county below Springdale and for 10-year, 20-year, 50-year, 200-year, and 500-year events for selected counties. Click here to download the hydraulic model results. Major floods in 1996 and 1997 intensified public concern about the effects of human activities on the Yel­lowstone River in Montana. The U.S. Geological Survey, U.S. Army Corps of Engineers, and Yellowstone River Conservation District Council began cooperatively studying the Yel­lowstone River in 2010, publishing four reports describing streamflow informa­tion for selected sites in the Yellowstone River Basin, 1928–2002. The fact sheet highlights findings from the published reports and describes the effects of water-use development and structures, primarily dams, on Yellowstone River streamflow. The U.S. Geological Survey, in cooperation with the Yellowstone River Conservation District Council and the U.S. Army Corps of Engineers, calculated streamflow statistics for unregulated and regulated conditions for the 1928–2002 study period. Unregulated streamflow represents flow conditions that might have occurred during the 1928–2002 study period if there had been no water-resources development in the Yellowstone River Basin. Regulated streamflow represents estimates of flow conditions during the 1928–2002 study period if the level of water-resources development existing in 2002 was in place during the entire study period. This master's thesis documents changes in the volume and timing of Yellowstone River runoff and the over-allocation of water resources of the basin. It suggests changes to water policy for the continuation of water availability. The Yellowstone Impact Study was one of the first major projects funded by the Old West Regional Commission that was directed at investigating the potential environmental impacts relating to energy development.